Take a break from the city and head to Nature & Wildlife Tours and Safaris. 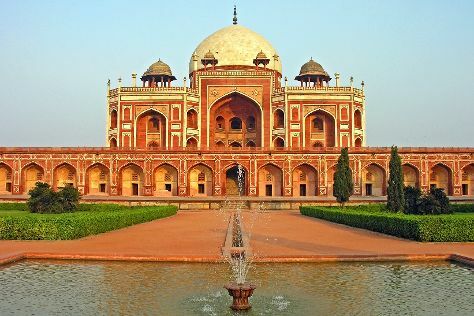 Get some cultural insight at Gandhi Smriti and Humayun's Tomb. Next up on the itinerary: steep yourself in history at Gurudwara Bangla Sahib, examine the collection at National Museum, don't miss a visit to India Gate, and look for gifts at Gulab Singh Johrimal. To see ratings, reviews, where to stay, and tourist information, you can read our New Delhi day trip planner. Use the Route module to find suitable travel options from your home destination to New Delhi. Expect a daytime high around 23°C in January, and nighttime lows around 9°C. Cap off your sightseeing on the 11th (Fri) early enough to travel to Jim Corbett National Park. On the 12th (Sat), admire the engineering at Ramganga Dam and then take an exotic tour of a safari tour. To see where to stay, photos, reviews, and more tourist information, read our Jim Corbett National Park trip builder tool . The Route module can help you plan travel from New Delhi to Jim Corbett National Park. Finish up your sightseeing early on the 12th (Sat) so you can travel back home.